Visa announced on Tuesday that it will be rolling out tokenization in Europe, an essential technology that allows for secure and convenient contactless payments using various technologies (via The Next Web). The tokenization service will be available to financial institutions in mid-April and helps pave the way for the launch of Apple Pay in Europe. “This is an exciting time to be in the payment industry. We believe that 2015 will be the year that mobile payments will be in the hands of consumers across Europe," said Sandra Alzetta, Executive Director, Core Products for Visa Europe. "Tokenisation is one of the most important technologies to emerge in digital payments and has the potential to start a whole new chapter in the kinds of products that are developed." Visa, MasterCard and American Express were among the credit card companies that launched tokenization in the United States ahead of the launch of Apple Pay last October. The technology replaces your credit card information with a randomized series of numbers during payment authorization to secure your account details when you tap your smartphone on a contactless payment terminal. Apple Pay remains limited to the United States, although an international expansion could start with Canada as early as March. 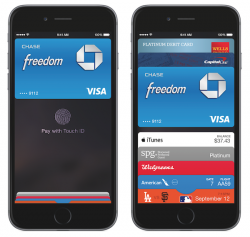 The NFC-based mobile payments service requires an iPhone 6 or iPhone 6 Plus, and will also be compatible with the iPhone 5s, iPhone 5c and iPhone 5 when paired with an Apple Watch. My guess is that Apple will announce Apple Pay coming to Europe and Canada as part of the Apple Watch event that is expected to happen within the next several weeks. :apple:Pay is why I would have money invested in Apple, if I could afford the risks of investing. It's why I got in when I did - albeit super late. But still, better at $94 than continuing to kick myself for not investing. Interesting news. I had no idea Tokenisation had yet to be rolled out in Europe. Good to here the pieces are falling into place, looking forward to an official launch later this year. This was known, and discussed. The same reason not even all USA Banks are supported. The banks(card issuers) have to implement technology on their end to support the tokenization. This is critical to the security of the system. Apple's role is merely to authenticate your card (PAN), into the DAN (device account number). They drop the PAN. At the time of transaction they send the DAN+time based crypto. Apple is done at this point. DAN+time based crypto gets passed through payment processor to the issuing bank, and VISA/MC/AMEX + the issuing bank has to be able to handle it. I hope Transport for London are are up to speed with supporting this. Being able to use Apple Pay on the Tube, without fishing around in my pockets for a card (or phone), will be my #1 or #2 reason for buying an iWatch ! I hope so too but I suspect the tokenisation might screw up the bit where you tap out because the system can't match it to a card you tapped in with. As I understand it, the Token (Apple calls it "Device Account Number") is generated when you set up your Apple Pay wallet. The same token would be used each time, so matching up touch-in with touch-out (and matching multiple journeys for the daily fare cap, etc) wouldn't be a problem. I believe the token looks just like a standard 16-digit card number, too, for compatibility with existing systems. The main potential issue is if your Watch battery goes dead - you wouldn't be able to use it interchangeably with the the actual card since, of course, the device account number wouldn't match with the real card number. Once the cards are added you can change the region back and Apple Pay will still work.